Especially if you’re a visual person, setting up your main clothes closet by color might really help you. This way you’ll always know your inventory (and hopefully not overbuy yet another white shirt or pair of black pants!). It also might be easier/faster for you to create outfits when getting dressed for the day. I always suggest within the color coding to group like items together so all skirts are together; dresses; blazers; pants; tops — and you may even want to segment short sleeved from long sleeved. 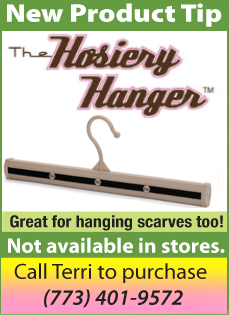 A good rule of thumb is to remove all empty hangers from within your hanging clothes as it’ll feel like your closet is overstuffed — when it may just be bulky hangers everywhere. Use a shopping bag on the floor to keep extras if there isn’t any room on the rod.